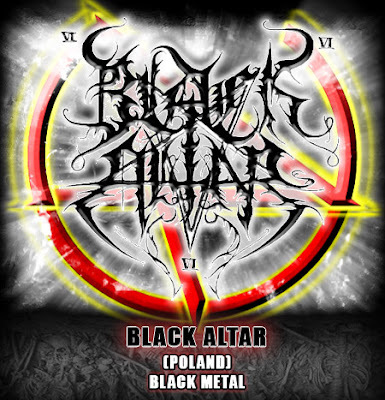 Here we are to present and review "Suicidal Salvation" the new mini-CD and second release for Polish Black Metal titans Black Altar this year ! This is a darkly terrorizing, frightening hollow and yet brutal black metal piece, a must for adepts of bands like Belphegor, Marduk, Necrophobic, Watain, Tjuder, Immortal, Dark Funeral and more! Without a doubt a great step forwards in the diabolical sinister sound of Black Altar, going darker and deeper than ever before in all this years of unholy existence! "Suicidal Salvation" is a great piece in every die hard black metal fan collection. Inhale the darkest winds of destruction in a haunted atmosphere of terrorizing blasphemy! Suicide is the only salvation for the weak minded on this kingdom of human slavery... unleash the chains and be the King of your own realm or fall deep into deaths embrace!! 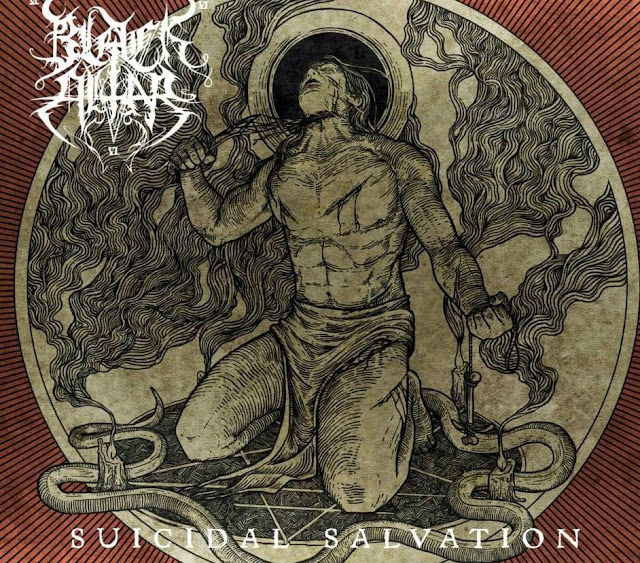 BLACK ALTAR Polish black metal titans have unleashed their second release in 2013, this mini-CD goes by the title of "Suicidal Salvation" and it was intended to be a split cd with the Swedish black metal legends Shinning. For all those unfamiliar with Black Altar, I can tell you that they've been born in a blasphemous Sabbath in the Night of Walpurgia Anno Bastardi 1996 by the hand of the dark lord Shadow, their only remaining and founding member. Since those times that the band has been rising with unholy strength to set a mark on Polish black metal scene, yet within the years, the band became a true legend on what they do. Always true to the underground black metal movement, they've been raising fans all across all this vast metal universe! This unholy crusade by the Black Altar guardian Shadow has given the band allot of respect on this strict musical genre. With their upgraded brutal and very own terrorizing black metal sound, Black Altar have reached a new level with "Suicidal Salvation" a great step forwards from "Death Fanaticist" (latest full length album) who got tons of great reviews, yet with this new piece of the band is making fans anxious for the next full-length album to come! "Suicidal Salvation" presents a renewed Black Altar sound, unleashing the same formula that given them their own identity but this time with the add of a darker brutal sound. Never before they have been closer to death metal fierceness, this aspect will probably please the fans of a more aggressive approach to black metal. A sound that shall please fans of band like Belphegor, Marduk, Necrophobic, Watain, Tjuder, Immortal, Dark Funeral and more! This conjured diabolical destructive sound shall feast the tortured souls appetite for a rough, yet brutal black metal sound. Still dirty and unclean but more powerful and destructive than ever before! "Suicidal Salvation" main concept deals with ending up your own life and entering the world beyond life itself as yet the great cover art by Babalon Graphics reflects. A journey where life and death are just in a distance of an act of self-offering. Black Altar takes your possessed soul deep into the lands of the dead, a realm so close to us all in a ritual suicide distance away. Within this release you will receive a glimpse of how it shall be, this world beyond life... and death! On Black Altar's terror scenario Shadow is the voice of horror in such frostbitten dark brutal blaspheme atmosphere! The work of Horizon on the tortured guitars and Horn of the Antichrist on drums sure bring Black Altar to a new level of intensity and dark brutality! The blackened rough production on BAT studio by Marek Heimburger sure catches the right sound for this album, forget about a crystal clean sound, this sound was meant to be dark and ugly, yet with due definition so that the details won't be washed away with the abusive uncleanness! Think that this albums underground black metal sound couldn't be much better than it is! The mini-CD works as whole, from the coldly dark piano intro on "The Sentence", a brutally dark track where Black Altar unleashes their horror identity on it's highest levels, followed by the title track "Suicidal Salvation" ignited by the blackest flames of hell, here the bright use of hollow keyboards sure add some melody to the darkest brutal sound. Time to go deeper and darker than black with the instrumental "Journey to the Astral Realm ", a trip into the darkest catacombs of hellish phantasmagoria, an unholy portrait of darkest musical art. "Pulse ov the Universe" brings forth Black Altar with their traditional terrorizing black metal sound, unclean and unholy as it can be. This album ends up with one of the most addicting tracks that the band has created so far, it goes by the suggestive title of "666 Mega Beast", addicting and so damn brutal, it was made to haunt your tortured ears for a long, long time!! "666 Mega Beast" the mighty devilish beast of the night! In all "Suicidal Salvation" MCD is a great black metal piece for adepts of deeply dark, sinister and unholy brutal black metal, as obscure as it can be! A must-have piece of horror in the darkest form of metal art! Blackest anthems of destruction and spine chilling atmospheres take this album to the best material being done in the genre. Death awaits us all, it's up to us how we both meet in the end, if by our own hand or by the hands of others. Lead your life and make your own destiny... then you will conquer death herself! !